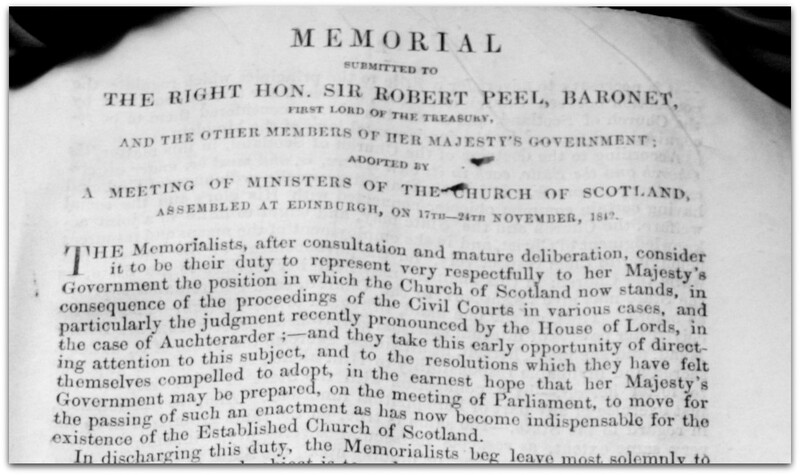 A Meeting of Ministers of the Church of Scotland assembled at Edinburgh on 17th -24th November 1842 resulting in the above memorial [ Scots Law ‘ a statement of the particulars of a case‘] being submitted to the Prime Minister, Robert Peel and his government. The ‘case of Auchterarder’ is cited as a cause for concern. It was here in 1834 that the parishioners unanimously rejected the patron’s nominee and refused to proceed to his ordination and injunction. The nominee appealed to the Court of Session in 1838 which held the Church in applying the Veto Act had acted beyond their powers. The Court went further and ruled that the established Church was a creation of the State and that it derived its legitimacy by Act of Parliament. The issue of patronage now esclated to the spiritual independence of the Church , which was now clealry on a collision course with the State. 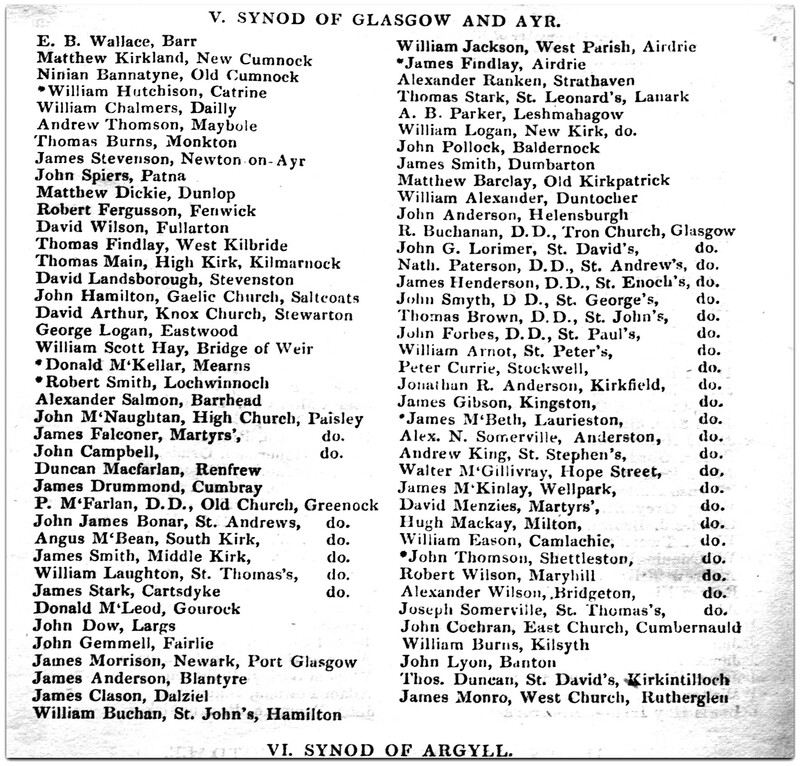 The memorial also contained a list of the ministers by Synod that supported the submission of the memorial. Included in the list are the Rev. Matthew Kirkland, New Cumnock and Rev. Ninian Bannantyne, Old Cumnock. So too, the name of Rev. David Arthur, Knox Church, Stewarton, the son of David Arthur farmer at Wellhill, New Cumnock and brother of William Arthur. In the 1841 Census David is recorded as a preacher living in the Findlay household at Park Lane, Kilmarnock – more than likely relatives of his mother Jean Findlay. 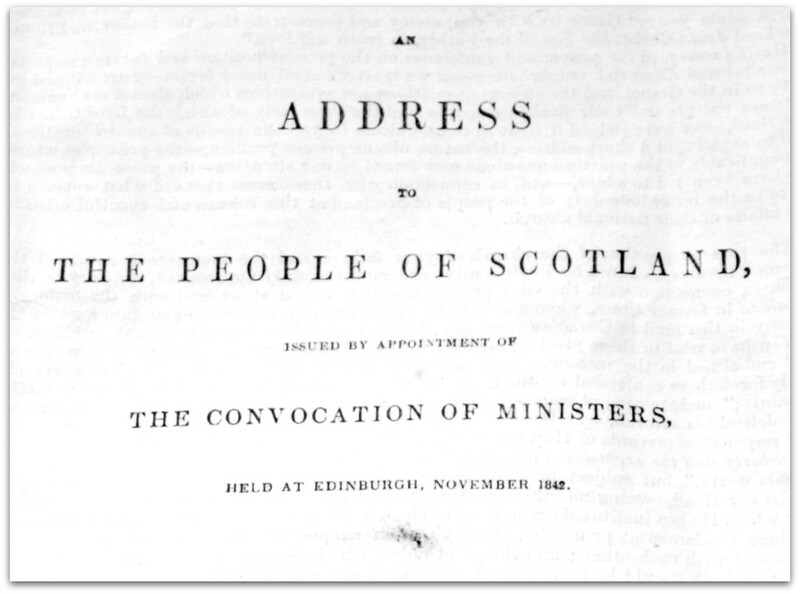 It is signed by the Ministers and Elders including Thomas Chalmers, the first Moderator and Mathew Kirkland , the first Free Chuch minister of New Cumnock. Matthew Kirkland’s signature followed by that of Claud Alexander, elder at Catrine.